Imagine going into a fine restaurant, ordering the filet at 50 dollars, and then while you were eating, having the waiter come back to your table over and over again explaining that the chef didn't realize that his cost of the filet was higher, that the cost of the gas to run the stove went up while he was cooking it and the busboy asked for a raise right after you ordered - so that 50 dollar filet? Well they were now charging you 110 dollars. Sounds ridiculous? Well, in the traditional model of a renovation, this goes on every day. There is nothing that strikes fear in the hearts of people about to renovate than the horror stories of how change orders can derail budgets and absolutely crush schedules. They are very unwelcome surprises and the easiest way to avoid them is to be sure to work with a Design / Build firm that prohibits them - unless you and only you change your mind on a specification or scope of the project. There is no place for a change order in a well-orchestrated, well-designed and well managed project. I cannot imagine how any buyer of a property can possibly establish their own budgetary priorities, not knowing how much their project will escalate as it goes on. And lastly, and possibly most importantly - architecture and design firms that do not prohibit change orders are using them as a primary source of revenue – rather than properly budgeting and bidding the project from the outset. We call that “the seduction” – which never, ever is satisfying. Short of that, I believe it's the absolute worst part of any renovation and one should avoid them at all costs. the Number 1 misconception about The Renovated Home: That we are expensive. Are we performing a premier, complete and cohesive offering to a renovation at the High End. Yes. But expensive? Let’s chat about this for a moment using a real world example. Let’s use a project with a price tag of $1,000,000. 11% for general conditions (defined in the world of renovations as – the unknown and overhead). That’s a total percentage of 34% of the 1,000,000 budget. the architect is usually compensated a percentage right around 20%. Those two layers – the layers of the traditional model – represent 54% of the total budget for the project being SPENT ON LAYERS – NOT ON TRADESPEOPLE, NOT ON MATERIALS AND NOT ON BUILDING. 54% on layers. That leaves 46% of the budget to actually spend on Stone, Plumbers, Millwork, Painters, Fixtures and Fittings, Electricians and, (well you get the idea). On a $1,000,000 project – that’s $540,000 for layers and management and 46% on ACTUAL WORK. Now The Renovated Home model. The Design/Build Model. The One Stop, Turn-Key approach. 4.5% for Architectural, 20% for Construction/General Conditions, 1.25% for Insurance. $260,000 of a $1,000,000 budget leaving $740,000 to actually build the project, buy the millwork, pay the plumbers, and pay the painters. That’s a 28% difference, a $280,000 total to either spend on the project or, even more revolutionary…..Keep it in your bank! A typical percentage for change orders using the traditional model is 20%. Sometimes double that – but 20% is a good gauge of what is being charged to clients AFTER the contract amount. That translates into a spread for value engineering and allocation of money to actually build of 48%! 48% more using the traditional model that our One Stop. Turn-Key approach. You tell us because the numbers don’t lie. A few years back, a prospective client wanted to speak to a recommendation of mine while he was considering my firm and I gladly obliged. The Recommendation: A great client who is a true gentleman and also incredibly successful in the financial industry. They spoke at length about myself and my firm and when they finished their chat – the prospective client called me and hired me on the spot. I thanked him tremendously and inquired as to what it was that the recommending client said that helped him make the decision – as he was on the fence and conflicted between the traditional model and our Design/Build offering. The recommending client shot back to the prospective client with this comment: “In Lee, you have a guy who will develop a budget for the project with you before he ever starts swinging a hammer and once you are comfortable with this – he will stick to it like glue – what else could you ask for”. The prospective client was horrified at the idea of not bidding out his project - but he later disclosed to me that the recommending client was spot on. What we were able to do wasn't really so incredible. We simply took our experience, both in design and value engineering of a project and developed a comprehensive design and contract price of about $1,400,000 – all transparent to the client. 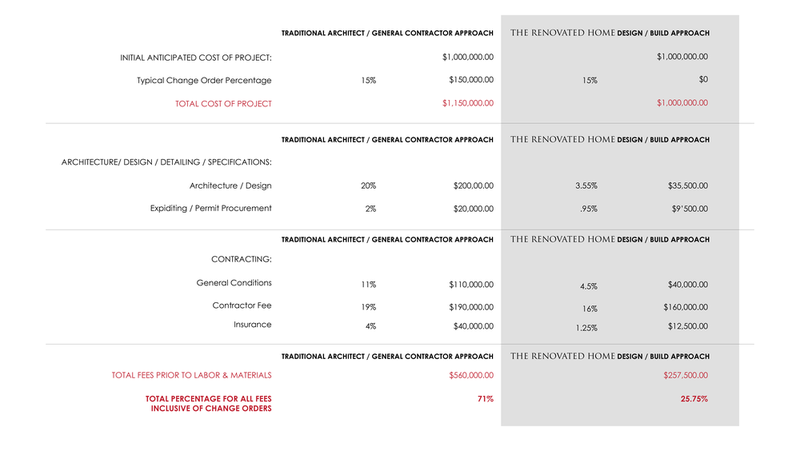 At the conclusion of the project (on the exact day that we committed to in our contract one year previously) – the pricing had not a single TRH generated change order, not one surprise bill. And one last important fact: The project was designed, built and completed through 2009 into 2010 – certainly the darkest days of our economy in our lifetime. The point of the story is to understand what the bidding process can provide and what it never does – no matter what it looks like on paper. If ones goal is to send their plans and specifications - drawn by one professional – out to a separate general contractor professional in the hopes that the collective elements will deliver the best price and most efficient project possible – that just never happens. In reality, it never leads to a fixed price contract, never values or quantifies the amount of time that model just eats up in expenses to the client (carrying charges and interest expenses of multiple residences) and ultimately highlights the disconnect between the lack of building a team approach from the outset – a team with one layer of responsibility, one point for both the good and the bad. The triangle of communication that results between the client, architect and contractor is rarely cohesive – and is hardly efficient on any level. Because it’s a triangle by definition – not a straight line of responsibility. Cohesion and responsibility through a team, non-layered approach cannot exist in this approach and so ultimately, its just a question of when, not if, the disconnects end up costing the client money and more importantly – time. Layers cost money that bidding can NEVER make up for. Not to mention the lack of responsibility that comes with these layers. Not to mention worrying about the financial stability of both the architectural firm and the general contracting firm. Financial stability or more succinctly stated – making sure that the contractor isn't using the deposits for your project to pay the balances of the projects that came before you (and believe me, that happens all the time) – is a critical component in choosing a contractor (far more important than if they are the “low bid”). Cash flow or the lack thereof also kills projects and doing your due diligence on both the architectural firm and the general contractor is so much more important that if the contractor is the low bidder. Build a team first and keep the responsibility at one level. approach and model since 1990.